I woke to find an offline IM in my email inbox from Easy Babcock. As a tribute to Michael Jackson, Sine Wave has produced a four-minute-long, two-person dance called Liquid Felon. I rushed along to Sine Wave, found a willing partner in Shiyojin Kaligawa and tried it out. Sometimes I have found Sine Wave dances a bit fast for SL, but this one is pretty well crafted, and seems to go on forever. It's definitely one worth having. 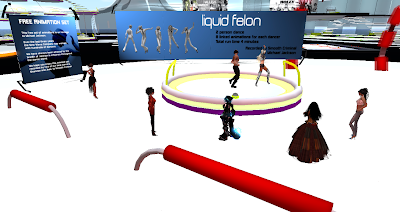 It was SO long it was hard to see when it restarted, but a couple asked us to let them have a go and so we ceded the platform to Katrin Daffyd and Philly Tigerpaw, seen above dancing the Liquid Felon.